San Juan de Guadalupe is one of the 39 municipalities of Durango, in north-western Mexico. The municipal seat lies at San Juan de Guadalupe. The municipality covers an area of 2343.1 km². As of 2010, the municipality had a total population of 5,947, up from 5,858 as of 2005. As of 2010, the town of San Juan de Guadalupe had a population of 1,712. 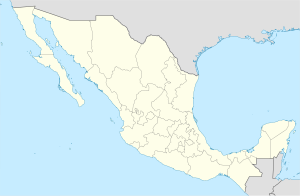 Other than the town of San Juan de Guadalupe, the municipality had 70 localities, none of which had a population over 1,000. ^ a b c "San Juan de Guadalupe". Catálogo de Localidades. Secretaría de Desarrollo Social (SEDESOL). Retrieved 23 April 2014. ^ "San Juan de Guadalupe". Enciclopedia de los Municipios de México. Instituto Nacional para el Federalismo y el Desarrollo Municipal. Archived from the original on February 21, 2007. Retrieved December 19, 2008. This page was last edited on 5 May 2018, at 01:28 (UTC).